The Maccabees successfully rebelled against Antiochus IV Epiphanes. The Temple was purified and the wicks of the menorah miraculously burned for eight days, even though there was only enough sacred oil for one day’s lighting. Purim, as a rabbinically decreed holiday. Hanukkah (Hebrew: חֲנֻכָּה‎, Tiberian: Ḥănukkāh, nowadays usually spelled חנוכה pronounced [χanuˈka] in Modern Hebrew, also romanized as Chanukah), also known as the Festival of Lights is an eight-day Jewish holiday commemorating the rededication of the Holy Temple (the Second Temple) in Jerusalem at the time of the Maccabean Revolt of the 2nd century BCE, Hanukkah is observed for eight nights, starting on the 25th day of Kislev according to the Hebrew calendar, which may occur at any time from late November to late December in the Gregorian calendar. 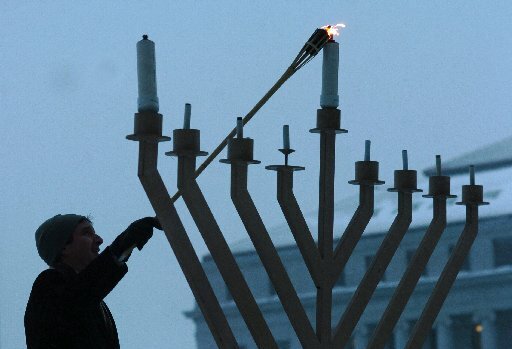 The festival is observed by the kindling of the lights of a unique candelabrum, the nine-branched Menorah or Hanukiah, one additional light on each night of the holiday, progressing to eight on the final night. The typical Menorah consists of 9 branches. An extra light called a shamash (Hebrew: שמש, “attendant” or “sexton”) is also lit each night for the purpose of lighting the others, and is given a distinct location, usually above or below the rest. The “shamash” symbolically supplies light that may be used.